As part of its 2017 work program, the office of the Inspector-General of Taxation (IGT) has announced that it is going to examine the ATO’s administration of an existing provision that allows it to hold on to GST refunds if it believes additional verification is required. Likelihood there is fraud or evasion, intentional disregard or recklessness about tax law. Timeframes written into the current law provide that the ATO can only retain a refund until the time it would no longer seem to be reasonable to ask for verification of information. It also cannot hold on to a refund (beyond the notification period) if it fails to notify the taxpayer that this is a possibility, nor if the relevant tax assessment was amended (an amendment ends the retention period allowed). 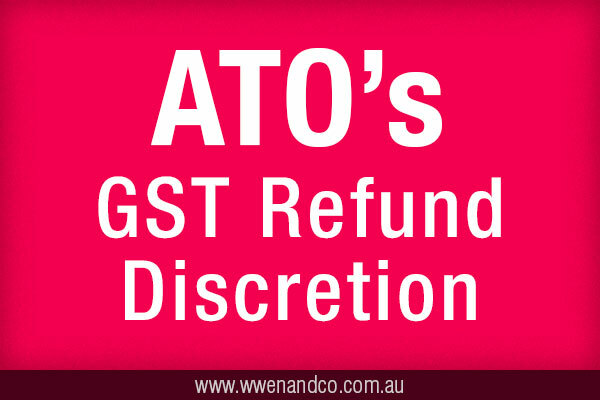 In announcing its work program for this year, the IGT says that complaints data, as well as submissions made for the 2017 program, had indicated that the ATO’s administration of the relevant provision in the tax act (section 8AAZLGA) might, in some instances, “result in inappropriate and unfair delays in GST refunds being issued”. The IGT says its review will examine the ATO’s approach in using this provision, the impact it has in taxpayers, and the need for any administrative or policy improvements. As well as examining the withholding of GST refunds, it has also flagged that it will review the pay-as-you-go instalments system. This change was initiated because of complaints that the system is generating confusion and misunderstanding for some taxpayers who are required to make payments. The Tax Commissioner has also requested that the IGT examine the state of the ATO’s services and support for tax practitioners. In doing so, the IGT will also examine concerns raised by tax practitioners on issues affecting their industry.